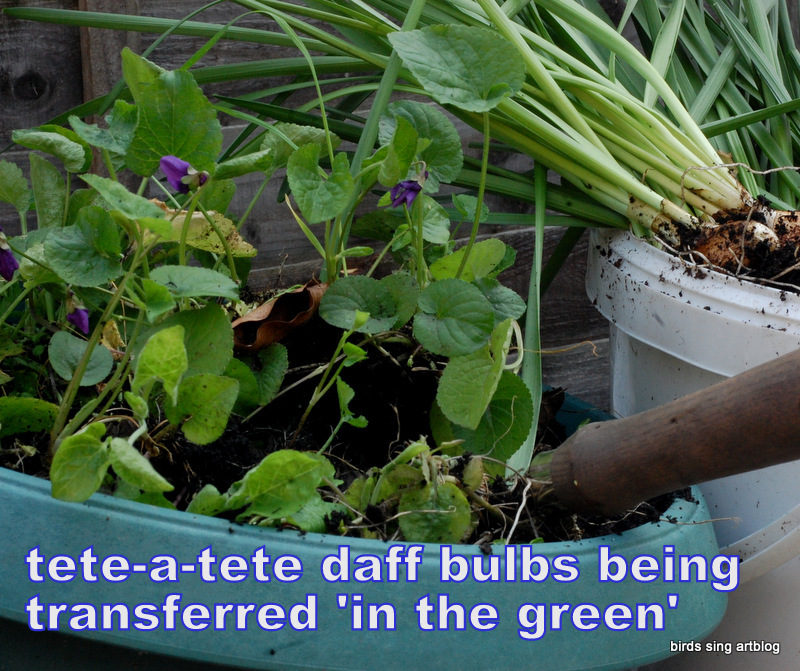 Spoonies are people with energy level issues, eg ME/ CFS/ MS/ fibromyalgia/ adrenal gland issues, parathyroid and thyroid issues, but the tips here might help anyone enjoy a garden – less effort, more enjoyment is the goal! With my horrible fall soon after I moved in, gardening tasks are even more difficult than when I gave up the allotment, so I have had to get very serious about no-dig and low maintenance gardening within the permaculture/ landspirit productive woodland glade I am aiming for. I have a workbench that helps a lot as I can only just kneel again, so David lifted the well watered tub (previously by the door with violets, daffs and hyacinths, mmm) up onto the bench, next to a bucket of compost. If you’re doing this alone, water AFTERWARDS, to keep the weight manageable, yes? I carefully cut the withered flowerheads off (if the flower sets seed, the bulb will die off) and ease the trowel under the roots loosened by watering. Trying to make sure no roots get snapped, gently lay the plants one by one into a seedtray or pot. Now take a break! Coming back, carry your tray to where you want to plant out. Tete-a-tete daffodils manage the superdry shade on the ivy bank well, so using the point of the trowel I scraped a very shallow drill between two ivy trailers, just enough to make a flat edge on the sloping bank. 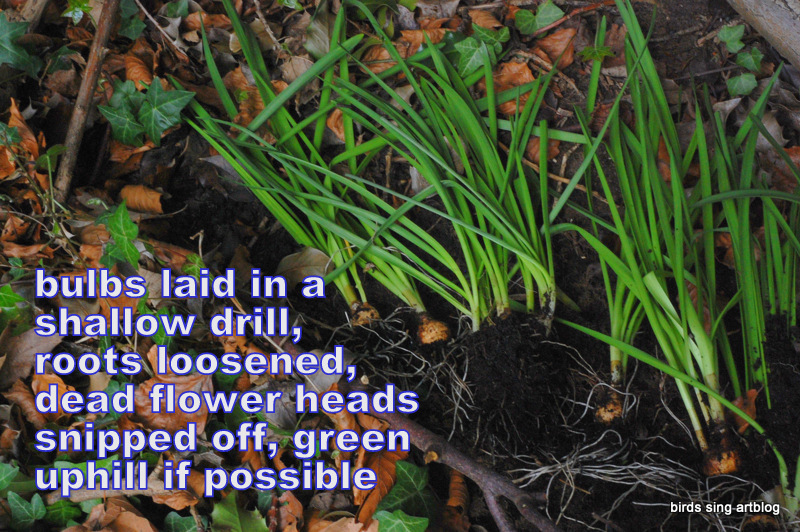 Arrange the bulbs with their roots on the drill and leaves all laying flat on the uphill slope. Break time? 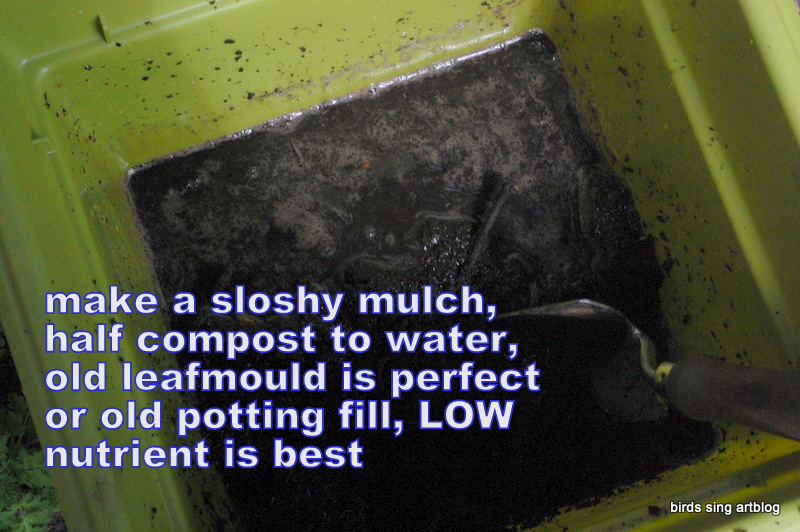 Fetch a bucket of runny mulch/compost and water, and scoop/pour over the roots. 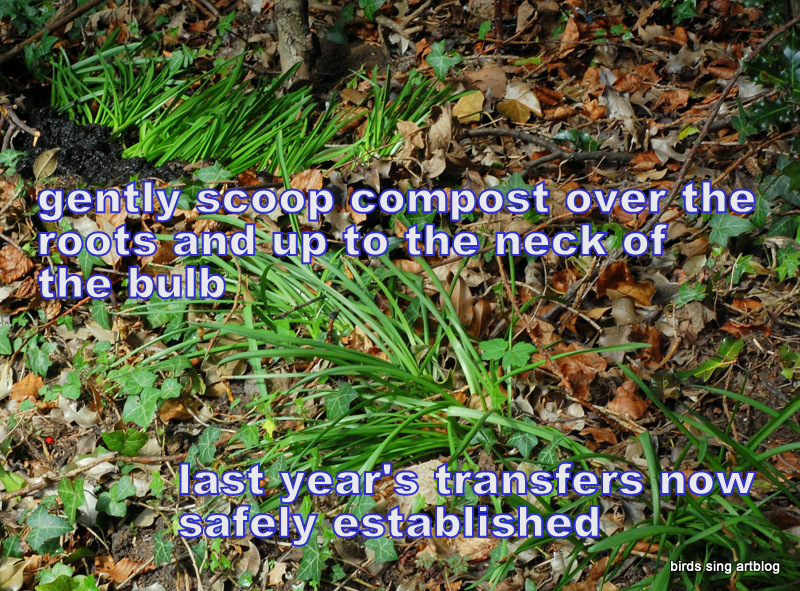 Press the mulch in gently, enough to be sure it won’t all roll down hill, but not hard enough to squash the bulbs. In two weeks time, water really well and then leave them to settle. 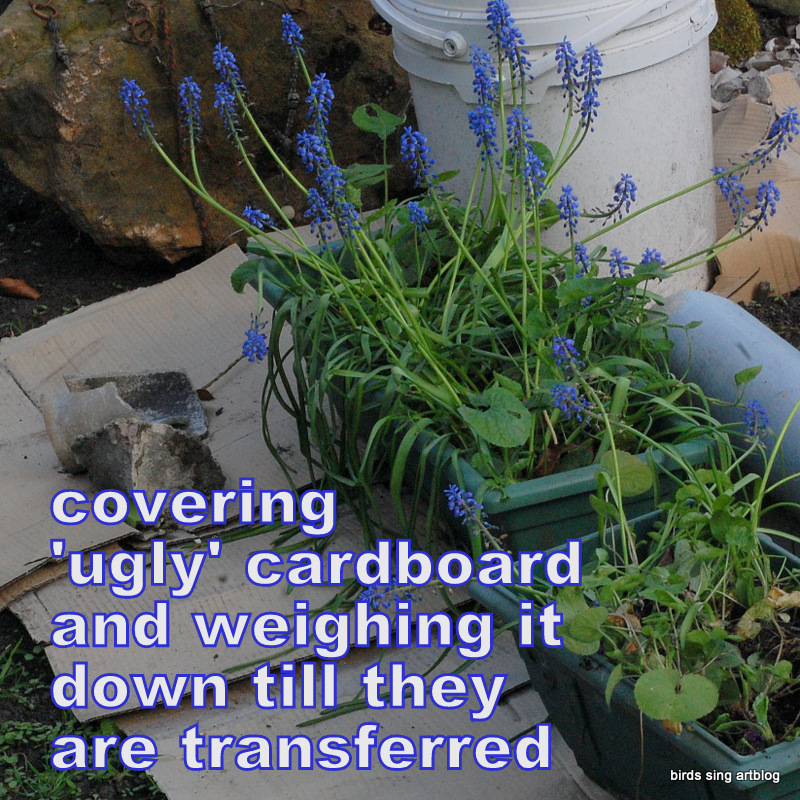 Personally, I don’t find cardboard mulch ugly, because it is so useful to me, keeping the weeds at bay until I can get to that task, and with some soils, it even improves the texture (sticky clays) but I do understand beauty is in the eye of the beholder! 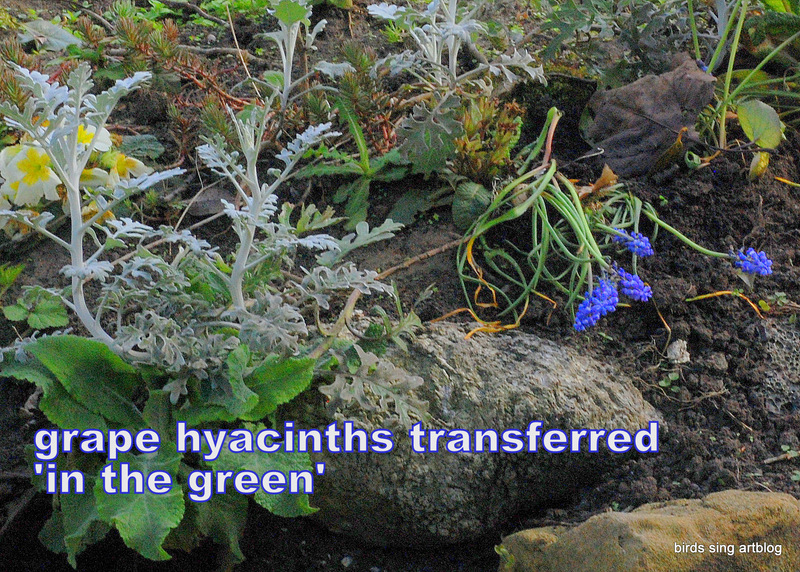 I will go back and snip the heads off the muscari/ grape hyacinth later. Only cut the flower heads off, most propagation strips the foliage right back, but as the leaves on bulb plants die back, all the necessary nutrients go back into the bulb. If you want it to grow again but hate the sight of the dying back, a good tip is to put it next to a plant that will fill out fast now that we are heading towards warmer nights, maybe a sedum or foxglove. 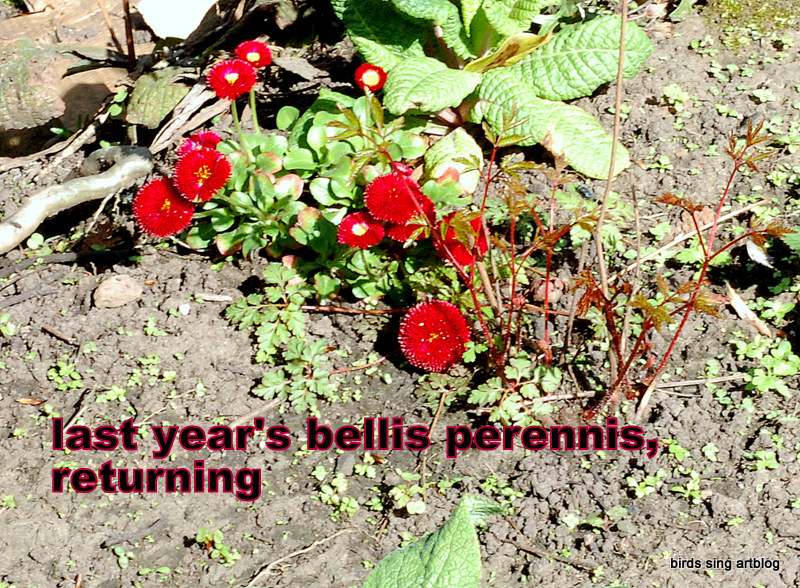 Early colour is very cheering and one of my new favourites are bellis perennis, perennial ornamental daisies, I love that deep cranberry pink edging when so much is pastel in the spring. This technique is more like planting out a squash/pumpkin plant. Make a mound, flat and shallow, or more heaped for something like tulips, with a dent where you are putting your seedling/ bulb/ in the green/ cutting. The dent for tulips has to be a lot deeper, they like to be a hand span down. 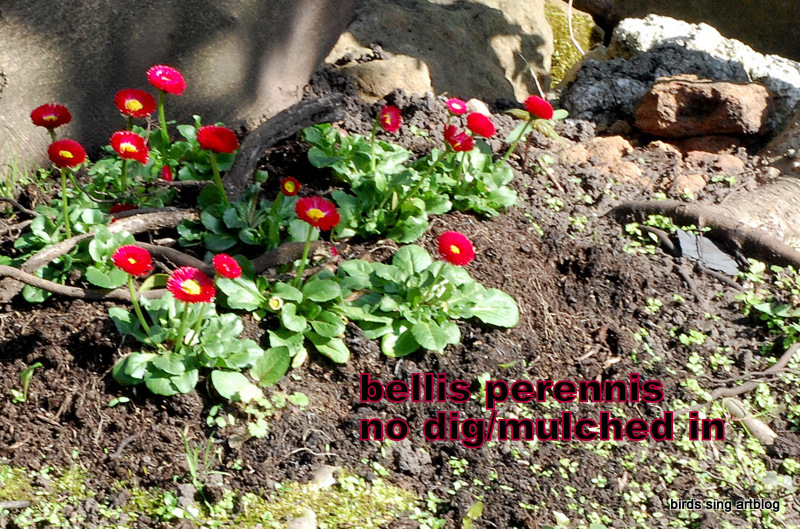 Again the mulch should be moist on a wet day through to really wet on a dry day – and it helps if you do it on a drier day, as the idea is to make the worms till/turn your soil for you. On a dry day when the worms have gone further underground, pouring soggy mulch on drier soil will bring them up and the action of turning the soil helps integrate the two. All without use of a spade/ shovel/ fork/ implement of agony for your back/ wrists/elbows or drain on your energy – yay! 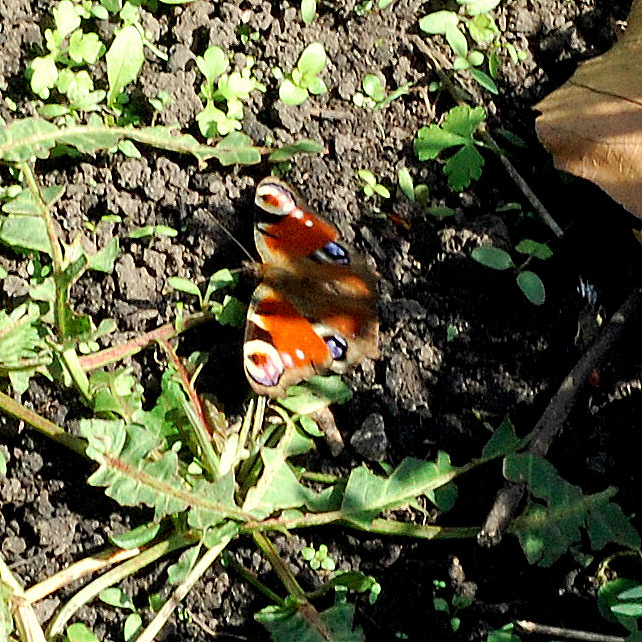 Lots more planting will be happening in this area, now the laurels and brambles have been cleared, I want to put in more bee friendly plants, hyssops, sedums, agastache, foxgloves…last year a huge forest of feverfew came up from the dormant seeds, so I’m hoping they will have survived the necessary trampling. Great tips and very sensible pacing. Wey-hey!